Nasa scientists spotted the huge sunspot forming through instruments on the agency’s Solar Dynamics Observatory, one of several spacecraft that monitor the Sun’s weather. 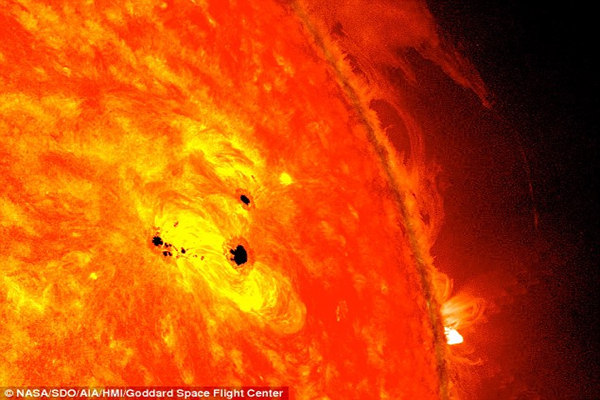 ‘Over the course of February 19-20, 2013, scientists watched a giant sunspot form in under 48 hours,’ said Karen Fox, a spokesman for Nasa. The sunspot identified by Nasa is formed of several dark blemishes on the surface on the Sun which have evolved rapidly over the past couple of days. The Solar Dynamics Observatory contains a suite of instruments that will provide observations leading to a more complete understanding of the solar dynamics that drive variability in the Earth’s environment. Sunspots are caused by intense magnetic activity and are actually cooler than the rest of the Sun, which leaves them clearly visible as dark spots in the photosphere. In reality, if the sunspot were isolated from the surrounding photosphere it would be brighter than an electric arc. Ms Fox added: ‘The spot quickly evolved into what’s called a delta region, in which the lighter areas around the sunspot, the penumbra, exhibit magnetic fields that point in the opposite direction of those fields in the center, dark area. The observation comes as the Sun is gearing up for the most active phase of its 11-year solar cycle. The Sun’s magnetic field lines are the most distorted at this time due to the magnetic field on the solar equator rotating at a slightly faster pace than at the solar poles. This causes large numbers of sunspots appear, and the Sun’s irradiance output grows by about 0.1 per cent. The increased energy output of solar maxima can impact global climate and recent studies have shown some correlation with regional weather patterns. The solar cycle takes an average of about 11 years to go from one solar maximum to the next, with an observed variation in duration of 9 to 14 years for any given solar cycle. Large solar flares often occur during a maximum. For example, the Solar storm of 1859 struck the Earth with such intensity the northern lights could be seen as far south as Rome. The last solar maximum was in 2000. In 2006 NASA initially expected a solar maximum in 2010 or 2011, and thought that it could be the strongest since 1958. However, more recent projections say the maximum should arrive in autumn of 2013 and be the smallest sunspot cycle since 1906. Sun spots every 11 years and its not abel to be known how bad until it happens,we have lived thru this many times before.